" ... Going through all these jewels, tapping and stroking the pad as I was testing this ebook, I felt some jealousy for the students who would enjoy this experience and see differential equations coming into life; a little bit as I felt jealous for my kids when they were discovering classical geometry with GeoGebra. Indeed, this is exactly the same kind of experience that Chazottes and Monticelli are offering you: no magical recipe to make you an expert, but a way to feel and grasp the concepts in a beautifully interactive, flexible and playful way." 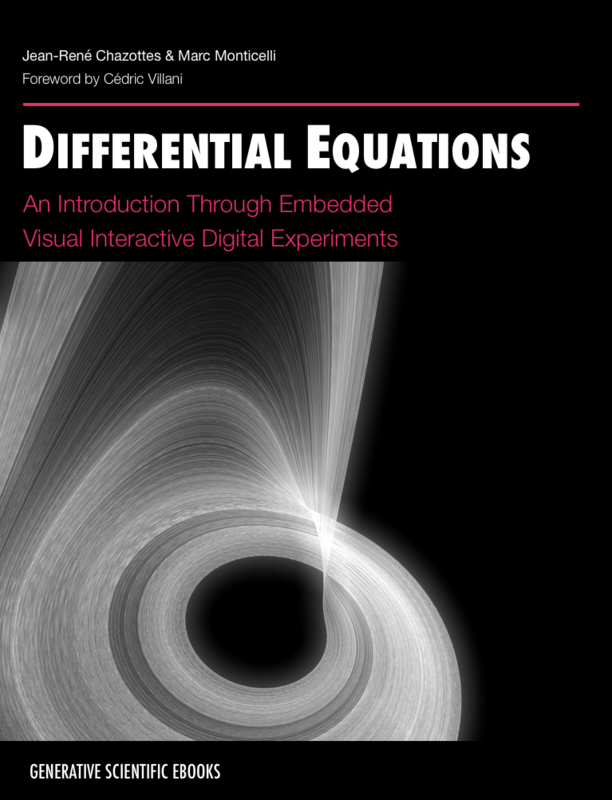 This is the first eBook with embedded interactive digital experiments. They will allow you to visualize the behavior of the equations and models we will study, and to experiment with them. A unique feature of this eBook is that you won't have to write any computer program, nor to install any software, since the digital experiments are embedded into the text. This eBook focuses on processes that can be mathematically idealized as differential equations. Such equations continue to be a major tool with which scientists make mathematical models of real systems in physics, biology, ecology, chemistry, economy, etc. Even if you can reduce the description of a real system to the mathematical study of a differential equation, this will not be the end of the story because most interesting differential equations are nonlinear. This implies that, most of the time, we are not able to write down the solutions in terms of elementary functions. Fortunately, qualitative methods were developed, yielding a general idea of how all the solutions behave without actually knowing them explicitly. Such methods were initiated by Henri Poincaré at the end of the 19th century. The main idea is to visualize all solutions of a differential equation at once by considering an appropriate abstract space, to get what is called a 'phase portrait'. The full power of this approach was revealed with the advent of graphics software packages which became widely available from the 1980's onward. The consequence in teaching differential equations was tremendous since students could see the solutions of a differential equation, thus grasping the overall behavior of the associated model. In particular, using graphics software packages has made possible to teach differential equations to nonmathematically-oriented students primarily interested in modeling. This revolution has also impacted modern textbooks on differential equations that contain many eye-catching graphics and snapshot views of computer experiments. In some of them, the reader is invited to buy and install a computation package on his/her computer, and use the worksheet files given by the authors. What we propose here is a major step forward: you simply read the text and interactively experiment with the models within the eBook. We hope you will enjoy this new experience!